Whether for a wedding, corporate event, concert or music festival I can supply a quality instrument at an affordable price. 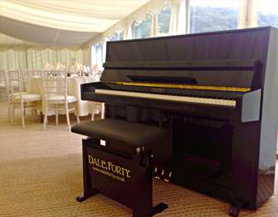 Upright, digital and electric pianos are supplied personally, grands are supplied in conjunction with other specialists. If I can’t supply the ideal piano personally, I will arrange for the appropriate company to hire to you direct. Unlike some competitors, I do not hire from third parties and add a mark-up, so all prices quoted will be the most competitive. Please contact for terms, availability and prices.